LONDON: Former champions Rafael Nadal and Novak Djokovic battled into the Wimbledon third round on Thursday but third seed and 2017 runner-up Marin Cilic crashed out. Djokovic, the three-time champion, needed treatment on his left thigh on Court Two but still had too many weapons for Argentina’s Horacio Zeballos, winning 6-1, 6-2, 6-3. Women’s top seed and French Open champion Simona Halep reached the third round with a 7-5, 6-0 win over China’s Zheng Saisai. The world number one, a semi-finalist at Wimbledon in 2014, will face Hsieh Su-Wei of Taiwan for a place in the last 16. The Romanian raced away with the 10 last games to beat the 126-ranked Zheng. 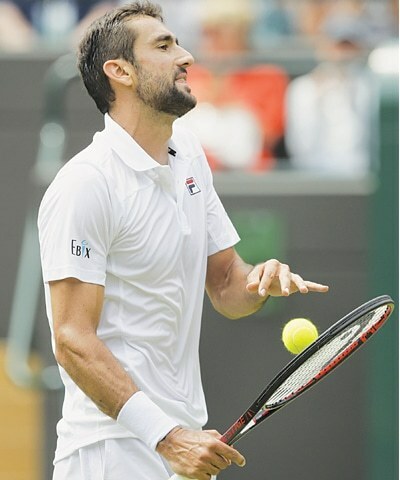 Cilic blew a two-set lead in his 3-6, 1-6, 6-4, 7-6 (7-3), 7-5 loss to Argentina’s Guido Pella, ranked at 82. “It was very tough because he played very well,” said 11-time French Open champion Nadal, who is chasing an 18th major. For Djokovic, meanwhile, victory was his 60th at Wimbledon — making him just the fifth man to claim 60 wins at the All England Club in the Open Era. Three-time major winner Stan Wawrinka was unable to follow up his first round defeat of sixth seed Grigor Dimitrov when he lost 7-6 (9-7), 6-3, 7-6 (8-6) to Italian qualifier Thomas Fabbiano. John Isner, the US ninth seed, saved two match points, fired 64 aces and 88 winners to defeat Belgian qualifier Ruben Bemelmans 6-1, 6-4, 6-7 (6-8), 6-7 (3/7), 7-5. Kyrgios could next face lucky loser Bernard Tomic if his Australian compatriot can shock Japan’s Kei Nishikori. Second round: 25-Philipp Kohlschreiber (Germany) bt Gilles Muller (Luxembourg) 7-6 (8-6), 7-6 (7-4), 7-6 (7-3); 8-Kevin Anderson (South Africa) bt Andreas Seppi (Italy) 6-3, 6-7 (5-7), 6-3, 6-4; Guido Pella (Argentina) bt 3-Marin Cilic (Croatia) 3-6, 1-6, 6-4, 7-6 (7-3), 7-5; 9-John Isner (US) bt Ruben Bemelmans (Belgium) 6-1, 6-4, 6-7 (6-8), 6-7 (3-7), 7-5; 31-Stefanos Tsitsipas (Greece) bt Jared Donaldson (US) 6-3, 6-2, 3-6, 4-6, 6-3; Thomas Fabbiano (Italy) bt Stan Wawrinka (Switzerland) 7-6 (9-7), 6-3, 7-6 (8-6); Frances Tiafoe (US) bt Julien Benneteau (France) 4-6, 6-3, 6-4, 6-2; 12-Novak Djokovic (Serbia) bt Horacio Zeballos (Argentina) 6-1, 6-2, 6-3; 15-Nick Kyrgios (Australia) bt Robin Haase (Netherlands) 6-3, 6-4, 7-5; Gilles Simon (France) bt Matteo Berrettini (Italy) 6-3, 7-6 (7-4), 6-2; Alex De Minaur (Australia) bt Pierre-Hugues Herbert (France) 6-2, 6-7 (8-10), 7-5, 6-3; 2-Rafael Nadal (Spain) bt Mikhail Kukushkin (Kazakhstan) 6-4, 6-3, 6-4. Second round: 1-Simona Halep (Romania) bt. Saisai Zheng (China) 7-5, 6-0; Hsieh Su-Wei (Taiwan) bt Lara Arruabarrena (Spain) 6-3, 6-3; 15-Elise Mertens (Belgium) bt Sachia Vickery (US) 6-1, 6-3; 26-Daria Gavrilova (Australia) bt Samantha Stosur (Australia) 6-4, 6-1; 17-Ashleigh Barty (Australia) bt Eugenie Bouchard (Canada) 6-4, 7-5; 14-Daria Kasatkina (Russia) bt Yulia Putintseva (Kazakhstan) 6-2, 6-3; 11-Angelique Kerber (Germany) bt Claire Liu (US) 3-6, 6-2, 6-4; 18-Naomi Osaka (Japan) bt Katie Boulter (Great Britain) 6-3, 6-4; 27-Carla Suarez (Spain) bt Sara Sorribes (Spain) 6-4, 6-1; 23-Barbora Strycova (Czech Republic) bt Lesia Tsurenko (Ukraine) 6-1, 6-4; Katerina Siniakova (Czech Republic) bt Ons Jabeur (Tunisia) 5-7, 6-4, 9-7. Second round: Jan-Lennard Struff (Germany) bt Ivo Karlovic (Croatia) 6-7 (5-7), 3-6, 7-6 (7-4), 7-6 (7-4), 13-11; 22-Adrian Mannarino (France) bt Ryan Harrison (US) 7-5, 7-5, 7-6 (7-4); Gael Monfils (France) bt Paolo Lorenzi (Italy) 3-6, 6-3, 7-6 (7-5), 7-6 (7-3); Mackenzie McDonald (US) bt Nicolas Jarry (Chile) 7-6 (7-5), 5-7, 3-6, 6-2, 11-9; Radu Albot (Moldova) bt Aljaz Bedene (Slovakia) 6-2, 4-6, 7-6 (7-3), 5-7, 6-3. Second round: 20-Kiki Bertens (Netherlands) bt Anna Blinkova (Russia) 6-4, 6-0; 13-Julia Goerges (Germany) bt Vera Lapko (Belarus) 6-2, 3-6, 6-2; Kristina Mladenovic (France) bt Tatjana Maria (Germany) 6-2, 6-2; 25-Serena Williams (US) bt Viktoriya Tomova (Bulgaria) 6-1, 6-4; Evgeniya Rodina (Russia) bt Sorana Cirstea (Romania) 1-6, 6-3, 6-3; Camila Giorgi (Italy) bt Madison Brengle (US) 6-4, 6-4; Lucie Safarova (Czech Republic) bt 32-Agnieszka Radwanska (Poland) 7-5, 6-4.